James Oglethorpe was angry after a friend of his died in debtors' prison and he called for an investigation into the conditions of British jails. He also formulated a plan to obtain the release of people from debtors' prison and to establish a new colony, south of Carolina, to be inhabited by the "worthy poor" of London. The "worthy poor" included the debtors and other homeless people. In the Royal Charter (June 20, 1732), granted by King George II for the colony of Georgia, a board of Trustees was established to fulfill this goal. As it happened, however, this plan was never fully realized. When the ship Anne sailed for the new colony on November 16, 1732, not one of the 114 colonists aboard had been released from debtors' prison to make the voyage. 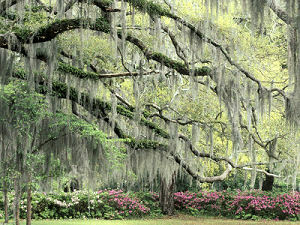 By early February, 1733, a small group of settlers was headed up the Savannah River. They landed at Yamacra Bluff on February 12th and Oglethorpe began the process of laying out lots for Savannah, Georgia. General James Oglethorpe's colony was the only U.S. colony founded as a refuge for the "poor and deserving". February 12, 1998 marked 265 years since Oglethorpe and his shipload of settlers founded Georgia. Since that time, Georgia has become the commercial leader of the region. The state now ranks first in the production of peanuts, pecans, lima beans and pimiento peppers. Savannah has been called "this nation's most beautiful city" and Atlanta has become the leading transportation center of the southeast. 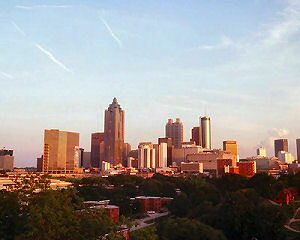 The famous Margaret Mitchell novel, Gone With the Wind was written in Georgia and Atlanta served host to the 1996 Summer Olympics. If you ever find yourself in Vidalia, grab one of those renowned "Vidalia Onions". So called for the importance of peaches in the Georgia agricultural economy. This nickname represented a determination in the Georgia citizenry to be leaders in industrial and economic development in the southern tier of states. Similar to the above nickname, "Yankee-land of the South" speaks to industrial and economic development in the south. This nickname may be used in a derogatory sense. Like "The Peach State," this nickname calls attention to the value of peanuts in the state. "Goobers" are peanuts. Along with Florida, Georgia has been called "The Cracker State" in earlier times. This Georgia nickname was a derogatory term that referred to immigrants, called "Crackers," from the mountains of Virginia and North Carolina. Crackers were considered less than ideal citizens. Buzzards are scavengers and Georgia, considering them a necessary part of the ecology, at one time passed a strict law for their protection within the state. People who live in Georgia or who come from Georgia are called Georgians. Aligning with some of the nicknames that have been given to Georgia, Georgians have been referred to as Buzzards, Crackers, and Goober-grabbers. "Sand-hillers" was a derogatory name given to poor and illiterate people who were said to live idle and wretched lives in the Georgia pine barrens. About two weeks after New Jersey, the state of Georgia came on board. On January 2, 1788, Georgia became the fourth state to join the union and the first of the southern states. The Georgia Peach is shown against an outline of the state on this commemorative quarter. Branches of the state tree, the Live Oak cradle the design while a banner displays the state motto: Wisdom, justice, moderation . Georgia (From Sea to Shining Sea) , by Pattie Stechschulte. 80 pages. Publisher: Scholastic Library Publishing (December 2001) Reading level: Grades 3-5. Presents information about Georgia's people, geography, history, landmarks, natural resources, government, state capitol, towns and cities, and more. Georgia (World Almanac Library of the States) , by Eric Siegfried Holtz. 48 pages. Gareth Stevens Publishing (August 2002) Reading level: Grades 4-6. Filled with the most up-to-date information, including the latest Census results. Full-color photos bring to life the story of Georgia. In addition to an in-depth factual profile of Georgia in the form of a state Almanac, this book offers fascinating and lively discussions of the state's history, people, geography, government, economy, culture, and lifestyles. A section on Notable People, a calendar of events, and enough primary source documents, time lines, maps, and other tools to make this unquestionably the best young adult reference material on the USA available anywhere. It Happened in Georgia , by James A. Crutchfield. 144 pages. Pequot Press (March 1, 2007) From a famous duel between two gentlemen statesmen to the formation of the Girl Scouts, It Happened in Georgia offers a unique look at intriguing people and episodes from the history of the Peach State. Visit Ocmulgee and Etowah, prehistoric sites where the early American Indians known as the Mississippians celebrated the Busk. Meet America's most-wanted man of 1865, Jefferson Davis-not only the fugitive head of the Confederacy but an alleged accomplice to Lincoln's assassination. And experience the Atlanta Braves' first home game of the 1974 season, when Hank Aaron hit his 715th home run, breaking Babe Ruth's 1935 record. A History of Georgia , by Kenneth Coleman. 461 pages. University of Georgia Press; 2nd edition (July 1982) First published in 1977, A History of Georgia has become the standard history of the state. Documenting events from the earliest discoveries by the Spanish to the rapid changes the state has undergone with the civil rights era, the book gives broad coverage to the state's social, political, economic, and cultural history. The work details Georgia's development from past to present, including the early Cherokee land disputes, the state's secession from the Union, cotton's reign, Reconstruction, the Bourbon era, the effects of the New Deal, Martin Luther King Jr., the fall of the county-unit system, and Jimmy Carter's election to the presidency. Also noted are the often-overlooked contributions of Indians, blacks, and women. Each imparting his own special knowledge and understanding of a particular period in the state's history, the authors bring into focus the personalities and events that made Georgia what it is today. Kenneth Coleman was professor emeritus of history at the University of Georgia. The coauthors are all members or former members of the University of Georgia's Department of History.